Retail design firm, Retail Design Collaborative, partnered with Studio One Eleven to design their new offices located in Long Beach, California. Retail Design Collaborative, an award-winning leader in retail design and a full-service architectural firm, in partnership with Studio One Eleven, an integrated practice of architecture, urbanism and landscape design dedicated to creating vibrant communities, has opened its new headquarters in downtown Long Beach, California. The headquarters transformed and occupies a former Nordstrom Rack and is 34,102-square-feet. The project was completed in March 2017. 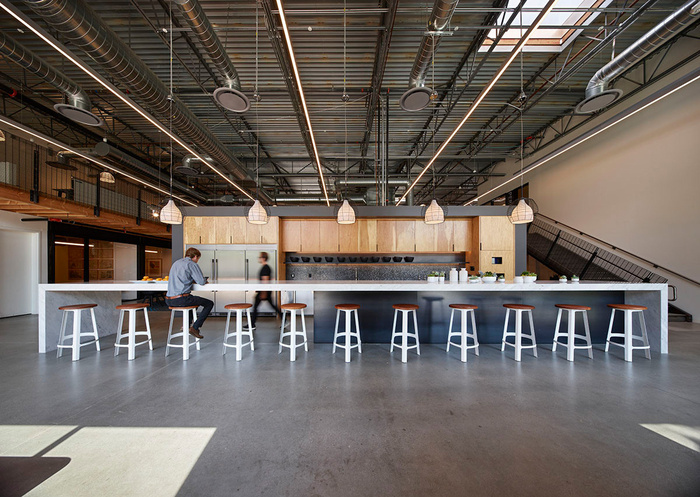 The creative workplace, which lives in a revitalized former Nordstrom Rack retail space, serves as both a highly-functioning collaborative work environment for employees and a vital connection to the Long Beach community that enhances the city’s public spaces. 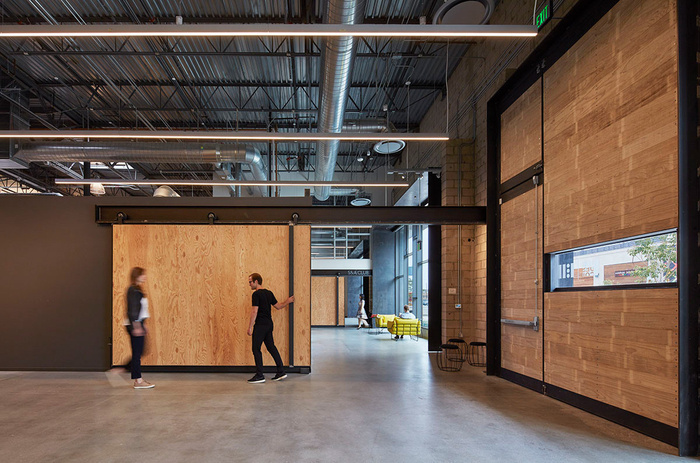 The office design supports the company’s values of connectivity and authentic interaction with the community and reflects the company’s commitment to environmental sustainability, exemplified by its LEED® Commercial Interiors (v3.0) and WELL Certification. Key features of the office space include the removal of traditional office spaces to create a transparent workspace that eliminates spatial hierarchy of the staff and creates intimately scaled flex spaces for communal use; casual meeting spaces are linked by pedestrian-style “streets and alleys” to connect the space together; open office and huddle rooms that act as collaborative pods; each wall surface is imagined for an opportunity for employees to share thoughts, ideas and inspirations with inviting pins and magnets for frequent use; a mezzanine wraps the perimeter of the interior to create a “bridgewalk” that overlooks lounges, workspaces and the surface walls; numerous open work clusters, idea lounges, enclosed collaboration spaces, war rooms flex offices, a community room, material library, Digifab shop, shower lockers and play areas, including a basketball court; and the service dock serves a dual purpose as an urban garden surrounded by green walls and city scale murals, encouraging casual gatherings, informal idea exchanges and community events.